Frustrated by how long it takes for Windows to fully load after you've logged in? So is just about every other Windows user on the planet. Now you can do something about it. The free Soluto, currently in beta, does a very nice job of helping you cut that time--in ways that no other program does. Soluto lets you select items to pause or delay at boot, shaving a significant amount of time off of how long it takes Windows to boot. 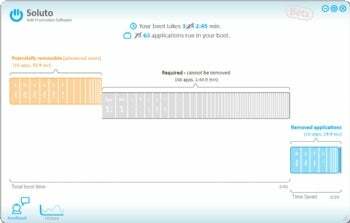 Soluto runs in the background and watches what programs and services load when you log in. It then analyzes how long each of them takes, and categorizes them according to whether they are required for Windows, potentially removable from Windows boot, or are instead a "No-brainer" that can easily be removed from boot. It bases this information on what the company calls the Soluto PC Genome, a database about many PC applications that the company has put together. It then shows you details about each application and service, by category of whether they can be removed each of those programs, and lets you determine whether you want to allow the program to remain in the Windows boot, whether you want to Pause it (which means you'll have to start the program manually), or whether you want to delay it, which means that Soluto will allow the program to load, but not at boot time. In that way, you'll boot more quickly, but the program will still be available after several minutes. I found that Soluto worked quite well. It cut about 30 seconds from my normal boot time of around three minutes and fifteen seconds. That's not to say the program is perfect. It recommended removing the excellent Outlook add-in Xobni from boot, even though that would mean Xobni wouldn't work when Outlook ran. And it was not able to provide details about every program and service that ran on boot. Also, keep in mind that if you uninstall Soluto, all the changes the program made will be undone. Still, those are relatively minor quibbles. If you're looking to cut your Windows boot time, Soluto is a solid bet.